"I want to do whatever they’ll let me do, to be honest with you." Though Turner Sports’ Brian Anderson is unquestionably one of the rising stars in the American sports media industry, the 47-year-old native Texan is quick to clarify that he’s been broadcasting games for quite a long time to get to where he is today. Anderson is standing in the back of a star-studded third floor ballroom Tuesday morning at the Hilton in Midtown Manhattan for the CBS/Turner March Madness media day, surrounded by peers with countless accolades and hundreds of years of combined experience. Anderson pointed out that his first paid broadcasting gig came back in 1994, even though it seems like Anderson came up the ranks relatively quickly. “My good friends call me the 20 year overnight success,” Anderson told Awful Announcing. His success is more evident than ever before. Anderson will call the first two rounds of the NCAA Tournament, with opening round matches on Friday alongside Chris Webber and Allie LaForce in Columbus on CBS for Iowa-Cincinnati and Colgate Tennessee during the day session and Washington-Utah State and Iona-North Carolina on TNT at night. Anderson’s group is listed as the number two March Madness crew behind Jim Nantz-Bill Raftery-Grant Hill-Tracy Wolfson. 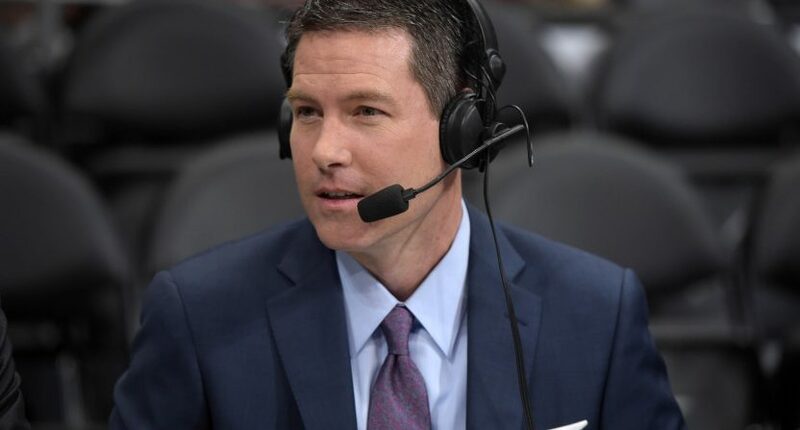 Anderson is also Turner’s lead play-by-play announcer for Major League Baseball, along with calling the NBA and golf for the network, and is the TV voice of the Milwaukee Brewers. Despite all that, Anderson said he’s actually calling fewer games than he ever has before. “I’ve always been a grinder,” he said. Anderson didn’t have as traditional a path to this point as other NCAA Tournament broadcasters, or announcers of his current stature. He played baseball at St. Mary’s University in San Antonio, a school with no broadcast journalism program. Anderson realized in his junior year that he wasn’t going to be drafted and thought he might try to give broadcasting a shot. Anderson didn’t think much of his chances as a kid until he saw what his older brother Mike actually accomplished. Mike was a pitcher in college and also wasn’t drafted by a major league team. But in June 1988, the Cincinnati Reds held an open tryout, and Brian caught his older brother in front of 250 other players and scouts. Chuck LaMar, later the original general manager of the Tampa Bay Rays, signed Mike that day. Mike made his major league debut five years later. Mike’s path through minor league baseball allowed Brian to travel with his big brother and see what broadcasting at that level looked like. That’s when Anderson really thought he had a shot. While Mike’s MLB playing career flamed out rather quickly, he took up life as a scout and his now a pro scout and a special adviser to Texas Rangers general manager Jon Daniels. Anderson got a job in 1994 calling minor league baseball for the Double-A San Antonio Missions, 1,000 games in nine years, and the work started piling up after that. He added Southland Conference basketball, Big 12 women’s games alongside current tournament broadcaster Debbie Antonelli and high school football. Anderson then became the sideline reporter for San Antonio Spurs TV broadcasts and later added duties as a play-by-play announcer for The Golf Channel, working 25 events a year. Anderson became the play-by-play man for the Brewers on TV in 2007, and was first hired by Turner to call postseason baseball in 2008. He’s since added college hoops, the NBA, and golf to his Turner Sports repertoire in addition to calling 90-100 Brewers games per season, while also trying to be present for his wife and daughter. Anderson will call the first two weekends of the NCAA Tournament before calling some opening games for the Brewers. He then has to get back to basketball and call NBA playoff games for TNT and NBATV. For most broadcasters, leaving a team you cover for a month before returning would be extremely difficult to deal with. Anderson said he tries keeping up with Milwaukee’s day-to-day by having conversations while he’s away with manager Craig Counsell and general manager David Stearns. And now with the PGA Championship moved from August to May, Anderson said he won’t be able “to come up for air” until close to Memorial Day. “It’s not hard, it’s fun,” Anderson maintained. MLB recently extended its main rights package with Fox Sports through 2028, but if Turner were to pick up a weekly national game at some point in the not-too-distant future, would Anderson be interested in such a role in that capacity? Anderson said he’s grown to love Milwaukee and the Brewers and that he’ll still live in the area even if he weren’t calling Brewer games. “I want to do whatever they’ll let me do, to be honest with you,” Anderson said. Anderson is thankful that the Brewers were accommodating when Turner came calling 11 years ago, and is now that he’s mostly working for Turner, he’s happy that the network still lets him still call games locally for Fox Sports Wisconsin. A November report from Andrew Marchand of the New York Post indicated that Turner could possibly elevate Anderson to the top NBA on TNT role ahead of Marv Albert for the 2019-2020 season, which means Anderson as soon as next year could call the conference finals and the All-Star game, Turner’s marquee events for pro basketball. No decision on this issue has been made at this time, same as the November report, a Turner spokesman said. And if Anderson is elevated to the top basketball role at Turner for the NBA, the wheels could turn in peoples’ minds and speculate whether Anderson could one day succeed Jim Nantz and call Final Fours. Anderson maintained that he’ll whatever he’s assigned. While he still hasn’t fulfilled his dream of calling MLB on the radio, and Bob Uecker is as entrenched as they get for the Brewers, Anderson seems more than satisfied with where he’s at in his career. After a quarter-century working his way up the broadcasting ladder and for someone who never thought he’d achieve what he’s achieved up to this point, Anderson is doing pretty well for himself, and is still on the rise in the greater broadcasting world.